← Westporters Set Cross Country Bike Race Record. The Rest Of Us Are Slugs. One of summer’s many pleasures is miniature golf (though these days it’s called mini-golf). You can’t find a course in Westport, of course. The 2 I remember from my youth — both on the Post Road — were long ago transformed into the Regents Park and Lansdowne condominiums. But there was a 3rd miniature golf course (and driving range) here. Tophat was located on Hillspoint Road, just over the railroad tracks on the right as you head to the beach. It sat opposite the Penguin — the old jazz club that eventually turned into a spooky apartment building. You can see the Penguin in the background above — and you can click here for that Friday Flashback, posted last August. Tophat occupied a special niche in Westport history. And — I am told — more than 60 years after it closed, golf balls still occasionally find their way to the surface on the lawns of the homes that now fill the site. So what happened to the Penguin? It too was demolished. And became condos. This entry was posted in Friday Flashback, Sports and tagged The Penguin, Tophat Miniature Golf. Bookmark the permalink. It was operated by (and maybe owned as well) by Angelo Gianitti. “Ok Gil” was the long time head greens keeper at Longshore. He was an original Saugatuck character. I used to live within walking distance of one of them. Driving Range, Miniature golf and Skating Rink all in 1. Later a noisy Disco, Town Garage, and eventual re-opening of the range and Mini Golf. (Worked there 1 summer, even, chasing golf balls and maintaining the putting greens.). And yeah, later demolished and turned into more unsightly Condos. Obviously this posting is close to my heart because my father opened the Westport Golf Range in 1954! I’ll bet that picture was taken sometime in the 1950s looking at how the boys are dressed. If I ever find a Time Machine, I’d like to go back 60 or 65 years and spend a few days in the Westport I grew up in! Paul E, great find. Many years later I went for countless walks on Hales Road and Hillspoint right by that property and had no idea, until the “06880” story a while back, that it was once a driving range and miniature golf course. And now I finally get to see a pic of the location as it was before my time. Jack, I have many fond memories of good times at your family’s miniature golf course and bowling alley. If you ever find that Time Machine, sign me up (although I also want to attend some of those great concerts at Staples I missed). PS does anyone recognize the kids in the photo? My dad and I would often go there after dinner to “hit a bucket of balls”. Would have been 60-65 years ago. Mid-50’s. Many fond memories. 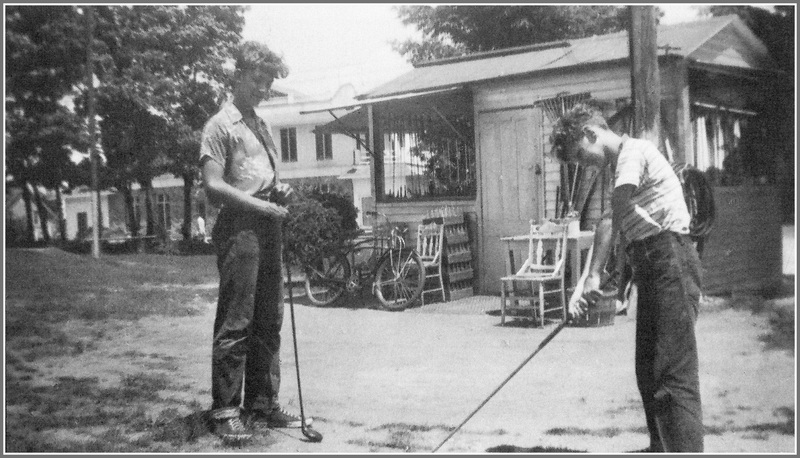 Can you imagine Planning and Zoning allowing a miniature golf course go into a residential area today? There’s about as much of a chance of that happening as Miami getting a 7 inch snow storm tomorrow, or us finding out Donald Trump is actually a virgin! Bill, your comment about going after dinner made me wonder whether they had lights there, and it seems they did (which surprised me because the neighbors seemed to be predominantly residential at that time—at least going down Hillspoint). According to a 1957 ad, the hours of the Top Hat Golf Range were 9am-11pm. Hit out balls and played miniature golf here many times while a Staples student. I believe the spot was owned and managed by Mr. Giannitti. Always a fun place to go when we were kids. In the summer, I used to basically live at the golf range on the Post Road. My friend, Joe Zioboro, used to work there and he would give me free buckets, and also free mini golf. It was a blast. Then in the evening maybe go over to pool hall to shoot pool. Good fun! Not only did Joe work at the golf range, but his sisters worked there too- Marsha, Barbara, and Tracy. Joe always was laughing and kidding around. It seems that everyone who worked there had a sense of humor. Being a fireman and raising five kids in Westport. Yes, those days are long gone. My neighbor, Tom Argenio, family had the same situation. It has felt weird at times over the years realizing that I couldn’t afford to,live in my hometown even if I wanted to! Thanks for all the interesting info. Mr. Zioboro taught all us kids to always “leave a window” in your car slightly open to prevent being overcome with fumes. Sounds like a firefighter! Oh yeah, our 6th grade St. Luke’s teacher, Mr. Leahy, used to give golf lessons there too. Interestingly, Joe Zioboro’s older sister dated a guy on the N.E. Patriots and she apparently got her “little brother” a job with the Pats which I believe he recently retired from. Westport connections! Joe Ziobro died about a week ago! Joe had open heart surgery when he was under five years old. I don’t know if his heart was the reason he died, but he was only 59. Pat Leahy worked at Westport Golf Range for a bit, and his mother and my mother were friends in the early 1940s in Bridgeport! I believe Kevin Gage worked at the golf range. If you remember, there were flood lights on top of telephone-like structures that illuminated the field. Kevin’s father used to change the lights for us. He’d climb up with those spiked shoes and then strap himself around the pole and change the bulbs! Thanks Jack. Yes, I would go,over to Joe’s and visit him while he was recovering from open heart surgery. His family was always very nice to me. I knew his sister Jody a little and didn’t know the very pretty Marcia. I just put in a call to Kevin and look forward to talking to him. Kevin did work at the range ….the most fun thing to,do was when Kevin was retrieving the golf balls in that cart, it would sometimes get stuck. Kevin would have to get out of the cart to,fix it. And when Kevin got out of his cart guess what we good friends did…..tried to nail him with our shots off the mat. I remember a couple of times Kevin gave up trying to fix the cart and just sprinted (and I mean sprinted) to the sideline. I don’t believe we ever successfully hit him, but it was fun. Not sure Kevin would agree. Wonderful memories. Let’s get a time machine and go back. My memory may be a bit off but weren’t there a few in ground trampolines there for a while, late 50’s? Early ’60s. Bedford Junior High coach/phys. ed. teacher Ed Hall ran it. It was called “Ed Hall’s Jumpin’ Gymyny” (or something like that). Ed Hall had them where Landsdowne condos are! Those condos were built on the town dump. It was a dump since the Civil War. I remember my father dumping old car batteries there. I hope the developers told the buyers they were buying their condo on top of the town’s dump. Thank you and Thank you. At my age it is good to know that I can remember things. The Ziobros and Gages made this golf range special.